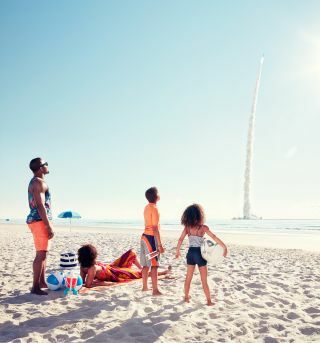 An ad from the world's first publicly funded space tourism campaign, Vacationauts, which encourages people who visit Florida to incorporate rocket launches and other space-related sightseeing into their vacation plans. A new advertising campaign seeks to turn Florida's vacationers into "Vacationauts" by encouraging people to incorporate rocket launches and other space adventures into their trips. Space Florida, a state-run space development agency, has teamed up with Paradise Advertising to launch the world's first publicly funded space advertising campaign. The agency is using multimedia to inspire people in Florida to add some space to their fun in the sun. A limited-edition poster from Space Florida's new space tourism campaign, Vacationauts, which encourages people to visit space-related attractions and watch rocket launches while vacationing in Florida. Space Florida's "WeAreGoFL" advertising campaign launched Sept. 23 and covers every aspect of multimedia, from funny television ads about Vacationauts to a mobile app and 1960s-inspired vintage poster ads. Space Florida's new multimedia space tourism advertising campaign published this animated GIF titled "Rocket Bump." Becoming a Vacationaut is free, and users can sign up with the We Are Go Vacationauts mobile app or visit the group's website: WeAreGoFL.com. The app allows users to locate and check in at Florida's space-related attractions, such as the Kennedy Space Center Visitor Complex, the Space Shuttle Atlantis exhibit, the Air Force Space and Missile Museum, and the Exploration Tower at Port Canaveral. WeAreGoFL also offers trip-planning resources for vacationers looking for non-space-related activities, like visiting local parks or hanging out on the beach. The app includes a map with the best beach spots for viewing rocket launches. An advertisement from the world's first publicly funded space tourism campaign, Vacationauts, which encourages people who visit Florida to incorporate space into their vacation plans. Checking in on social media at various Vacationaut stops allows users to earn up to 26 badges and rise in the ranks to become a "Vacationaut Captain." But there are other ways to earn badges without checking in somewhere. For example, the Vacationauts app is filled with polls and quizzes that provide badges upon completion. Educational quizzes test your knowledge of all things space, and include questions on Mars, the moon and the Milky Way galaxy. But the quizzes are not all about space trivia. Others are more like questionnaires that help Vacationauts answer questions like these: What kind of alien would you be? What kind of space food are you? What planet should you really live on? Would you survive in a space colony? A few lucky prospective Vacationauts also have the chance to win a Vacationauts mission kit, which includes a vintage-style metal lunch box, astronaut ice cream and other cool Vacationaut supplies. Terry Preston, a spokesperson for WeAreGoFL, said the campaign is "planning a handful of giveaways in the coming months via social media, the We Are Go Vacationauts website and engagement on the We Are Go Vacationauts app. These giveaways will also include pens, patches and more." Preston said the poster images will be available for download at WeAreGoFL.com beginning in mid-October.